The Crossroads of Western Iowa Foundation has one focus . . . that is to support the needs of the consumers of Crossroads of Western Iowa and the wonderful services they receive. These services include day habilitation through the LINKS program, along with residential and employment services. 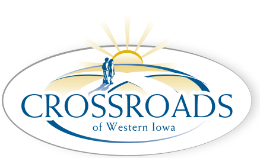 The Mission of Crossroads of Western Iowa is to empower individuals to actively seek out opportunities for an enhanced quality of life. The CWI Foundation endorses that Mission, and supports it with financial resources whenever possible. Crossroads' services are provided in the communities of Missouri Valley, Council Bluffs, Onawa and Sioux City, Iowa . . . by a staff of over 300 caring people, serving an estimated 325 individuals with intellectual disabilities, serious mental illness and brain injury.